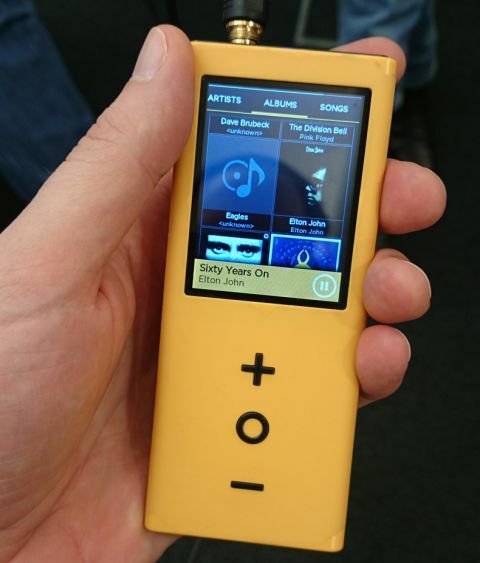 Pono PonoPlayer hands-on review | Music players hands on review | What Hi-Fi? It's been a while since there has been as much hype around a portable audio product as there is around the Pono PonoPlayer. Pono is the company backed by Neil Young, which aims to deliver an ecosystem for "the best possible listening experience of your favourite digital music". The PonoMusic Store promises to have the biggest library of high-res music for download, while the PonoPlayer aims to be the best portable machine to play it. Together, they comprise the PonoMusic ecosystem that Young hopes will "preserve the history of music, in all of its beauty and expression, for all time. Forever." Beneath the hyperbole, the project has become the focus of the mainstream media when it comes to high-resolution audio. The Kickstarter campaign, which brought the project to fruition and should deliver the first PonoPlayers to customers later this month, raised a whopping $6,225,354, one of the most successful Kickstarter campaigns of all time - and generated almost as many news stories in the process. So all eyes are on Pono. And for now, the PonoPlayer. We got our hands on one of the first PonoPlayers in existence at an Omnifone event in London. Omnifone is one of the largest business to business providers of music services in the world, and works with a huge number of services from Spotify to Sony Music Unlimited to Rara. And now Pono. Supposedly number nine of nine PonoPlayers in existence, we had some time to hear a little more about the player from Matt White, Omnifone's audio expert, get our hands on the device, take a look at the hardware and software, and of course give it a listen. A hands-on review is always a quick first impression of a product, and in this instance we were told the PonoPlayer was still, theoretically, a prototype. We'd assume it should be pretty close to the real thing with the launch date so near, and we were certainly invited to judge the sound quality. But for now, we'll assume both the hardware and software could yet be subject to final tweaks. The angular design of the PonoPlayer has been the subject of plenty of column inches – and a fair bit of ridicule. It certainly looks big when you first see it in someone's hand, atuned as we are to slender smartphones or increasingly compact iPods, but we're happy to report we're much happier with the design once we get our hands on it. Firstly, it feels much lighter than we expect. Yes, it's absolutely chunkier than the average smartphone and most portable music players (PMPs), but it is comfortable to hold, the shape fitting naturally within the palm of your hand. The yellow rubber casing helps on the comfort front and should presumably offer some protection should you drop it. It feels solid, though this unit's finish to edges and joins certainly had the feel in places of an early unit. Still, the final model is unlikely to be susceptible to bending - not least as those angles should ensure you're not tempted to tuck it in your back pocket before you sit down. We're happy to report the Toblerone-shaped dimensions (5x2x1in) don't look or feel ridiculous in a trouser pocket. It's slightly bulbous but arguably less restrictive than much taller, wider, super-size phones, such as the iPhone 6 Plus. Pono says the design is due to the fact "it was not possible to put some of the large audio components into a thin package". This design allows for those better components, and for them to be given enough space to breathe to prevent electrical interference between them. It also means there's room for a cylindrical, more efficient battery. The PonoPlayer claims around 8 hours of battery life for continuous music playback. All told, it may be a Marmite design but we think the practicalities of the shape will be much easier to get along with in reality than many people predicted. We're yet to see a PMP that matches a smartphone for the usability and interface, and we fear the PonoPlayer will be no different. There are three simple buttons for adjusting the volume and basic navigation, plus a touchscreen display. The buttons seem fairly responsive to our prods and while we wouldn't exactly say it's a premium experience, they do the job. And it's more of the same with the LCD screen. It feels like a 'last-gen' touchscreen compared to the flagship phones around and, while it worked well enough - and we may well not have been seeing the final version, according to White - we somehow doubt it will be more than a 'good enough' user interface. That's a shame, and while it may not bother many users who are largely interested in the sound quality it could be a barrier for a more mainstream audience coming afresh to the idea of a separate music player and expecting an experience akin to their Android and iOS smartphones. Pono says squeezing in the better components is the main reason for the shape, but it also means the player can lay horizontally on a desktop and still have an easily visible display. The display flips between landscape and portrait as you manouevre the device. We can see the logic - Pono want you to use this player everywhere, not just on the move - though we're not convinced it's a deal-breaker. Ultimately, you're unlikely to be shouting from the rooftops about the PonoPlayer's interface and the overall user experience. As we size up the design, the first feature we notice is the two output jacks. Both can be used for headphones, and you can listen simultaneously with a pal should you so desire. And this works fine, though removing one of the jacks will pause the music for the other user (pausing music when you pull out the headphones being a fairly standard and useful feature on any phone or PMP). The PonoPlayer comes with a 64GB internal memory and an SD card slot for expanding that further (the Pono Kickstarter page says the player supports microSD cards up to 64GB and SDXC microSD cards of 128GB or higher). The PonoStore, accessible via the PonoMusic App on Mac or PC, will reportedly be live at launch and is set to deliver music in FLAC, but the PonoPlayer will support the usual array of file formats, AIFF, AAC, ALAC, MP3 and WAV – but not DSD. There's no support for WiFi or any mobile network connection, so it's strictly a music player not an internet browser or iPod Touch-alike. There's a micro USB slot at the bottom of the device for charging and in order to connect to your computer to transfer files. Finally, a light at the top of the device is said to only glow when you're playing high-res music. We're not in the business of making snap judgements after a short time with a potentially unfinished device... but, naturally, we weren't going to leave without a listen. With no opportunity to compare to existing players on the market, nor to listen to our own choice of tracks, we instead flicked through some of the pre-loaded, high-res content. And our first impressions of the sound quality were undeniably positive. Listening through a pair of Beyerdynamic DT 770 Pro headphones, Neil Young's Heart of Gold (yep, there was plenty of Neil Young on board), sounded spacious and detailed, with Young's voice crackling with emotion and a real sense of texture to every strum of the guitar. The trademark harmonica rasped loud and clear without sounding harsh, the PonoPlayer maintaining composure even at high volume. Switching to something more up-tempo - and produced within an inch of its life - in the form of Daft Punk's Random Access Memories, the PonoPlayer had no problem keeping time, sounding punchy and powerful with solid bass notes. A bit of Elton John was followed by a blast of Led Zeppelin, and all told it was clear that this player, when fed top quality material, will be no slouch in the sound quality department. Which is of course the idea. We look forward to finding out how it compares to the likes of the Astell & Kern AK100 Mk II, iBasso DX50 and Sony NWZ-ZX1 when we get the finished article in the building for review. With Charlie Hanson from renowned high-end audio company, Ayre Acoustics, having worked on the internal circuitry, DAC and overall tuning - with Digital Audio Review suggesting the player will use the ESS Sabre 9018 DAC - we certainly have high hopes for the PonoPlayer's audio performance. The design of the PonoPlayer isn't for everyone. That said, our hands-on time did allay our fears around the weight and bulk - it's lighter and generally more manageable than we thought it might be from the press images. Similarly, if you're looking for a device that packs in every spec imaginable and feels like the latest and greatest portable device to use, we fear you'll be disappointed. Allowing for potential tweaks ahead of the official release later this month, we'd still expect the interface and user experience to be less impressive than the latest smartphones. A touch disappointing maybe, but it also perhaps confirms that Pono really is all about the music. And on that front, we're much more impressed - and eager to get our hands on the finished product for a longer period of time. With PonoMusic promising to have the biggest library of high-res tracks available to download - taking on HDtracks and Qobuz - the Pono plan is about more than just the PonoPlayer.